We deliver concrete to construction sites with our state-of-the-art mobile concrete preparation units. For every construction project we engage in, we develop an individually tailored strategy taking into consideration the specific needs and conditions of the construction site in order to guarantee optimal quantity and quality. We offer simple and immediate solutions to your unexpected demand for concrete production output. Thereby we fullfill the worldwide standards for a consistent quality of our concrete. Our concept works, because it is always tailored to your specific needs. High performance, top concrete and construction quality result in time- and financial efficiency. Because of the modular structure and adaptable assembly options we can offer you the most flexible and personalized ability to respond to changed construction conditions. "Our ambition: Best quality, for the best price – right on time"
The modular structure of our mobile units allows for the greatest possible flexibility, adherence to schedule, speed in installation and production. Our computerized facilities and production planning control guarantee consistently superior quality. Installing and dismantling of our concrete production units can be done within 3 working days. *) The indicated hourly capacities refer to a wet mixing time of 30 seconds. At Mobile Betonkonzepte GmbH, we specialize in catering to your personalized and complex production requirements for high quality concrete in large-scale construction projects. For tunnel construction, generating plant construction and structural engineering, every single building component needs to meet highly adapted properties and mixtures. We develop the suitable concrete composition for your needs. We finely align the logistics and facility components to your construction requirements, and adjust to your individual concrete needs. Rely on our expert knowledge to provide you with the right choice of concrete materials and mixture to fit your needs. If required, we seek out excavation and raw material and process it into high quality aggregate, which can be added to the concrete prepared for you on-site. 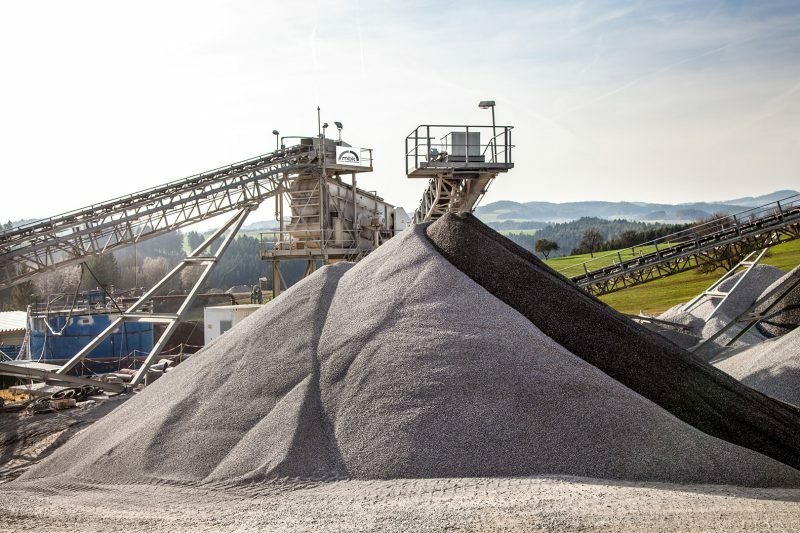 Our partners at RMC, Stueckler and Tieber support mbk with their knowledge and experience in gravel stripping and preparation as well as waste disposal and repository. Benefit from our decade-long experience with gravel aggregate preparation. Even under the most challenging of conditions, we deliver consistently high quality gravel aggregate. We take care of installing our mobile concrete mixing units and the gravel preparation facilities of your choice. We cover all logistics, like haulage and evacuation as well as installation and dismantling of the units; we establish an calculate a service package perfectly tailored to your needs ahead of your construction process to ensure we can provide full provision and operations of the cement mixing and gravel preparation units. We cover everything: from the transportation of the concrete to your construction site to delivery of raw materials from our providers to our mixing plants. A reassuring thought – let an experienced concrete production service provider take care of your important decisions and service choices. If need arises, we can work around the clock: this way we guarantee consistent quality and speedy execution for your construction project. Our long-standing and reliable subcontractors and partners are always available to provide additional services and production volume if your construction project requires additional performance. In addition to construction developers, we also work closely with raw material providers for cement and concrete additives as well as local gravel aggregate providers. If required, our concrete preparation units can be equipped with a heating system in order to withstand even harsh winter conditions and guarantee consistent concrete quality- and temperature year round. Conversely, we install powerful cooling systems during summer months to ensure smooth and efficient production. We use state-of-the-art equipment and facilities to ensure minimum environmental impact and exploitation of resources. On-site concrete preparation makes for short transportation stretches, minimal fuel consumption and CO2-discharge. We harness existing resources by applying efficient gravel preparation techniques on site, and we process excavation work and excavation materials to minimize the strain on surrounding terrain. If required we also provide suitable concrete recycling options, treatment and disposal. Making effective use of resources by being economical, gentle on the environment and cost-effective facilitates compliance with legal stipulations and contributes to the overall environmental soundness and of your construction project. Production and preparation on-site as well as appropriate disposal and storage possibilities ensure minimal oversize load traffic on local roads and allows for adherence of weekends resting periods and business hours. 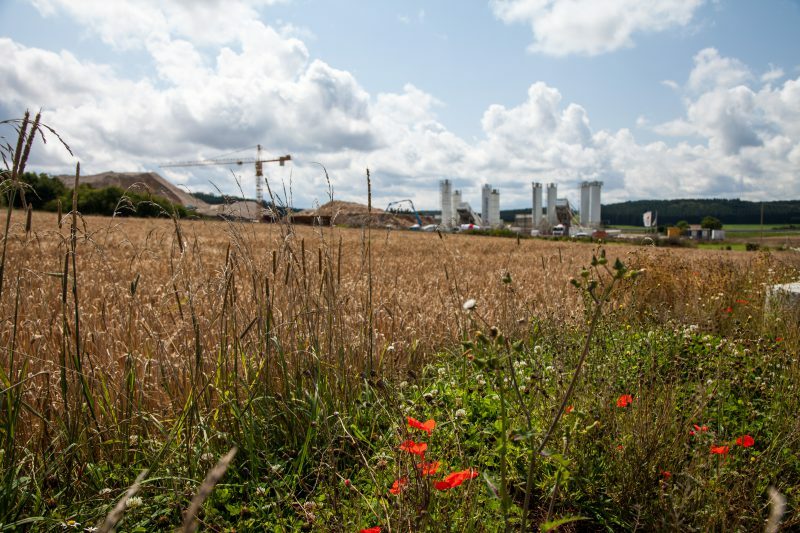 We build on over 30 years of experience in concrete production for large-scale construction projects in Germany, Austria and Switzerland – supported by our extensive network of subcontractors and partner providers. Our transparent, goal-oriented company culture ensures short yet concise decision paths. This allows us to be highly flexible and to fulfill any unforeseen needs on short notice. We gladly take care of your every enquiry and request – and we always strive to offer you the most cost-effective solution. Our headquarters for Germany and Switzerland are located in the heart of Munich, while operations for Austria and southern & eastern Europe are headquartered in Röthelstein in beautiful Styria. Our top priority at all times is, finding the right service for your needs. We organize and conceptualize – for you! As your preferred contact and ally, we are always available for you to rely on our experienced staff’s knowledge and know-how on concrete and gravel preparation. On top of that, we have our partner subcontractors available to provide additional help and services whenever needed.